Apple has recently filed a patent application with the US Patent and Trademark Office as it tries to integrate a combined input port into its notebook lineup, with the images showing a MacBook Air. Turns out the patent application has freaked out notebook vendors. According to Digitimes’s sources, notebook vendors are concerned because if the UPSTO grants the patent to Apple, the company will gain “the upper hand in competition” for slim notebooks. The sources pointed out that Apple’s patents for MacBook Air’s wedge-shape industrial design in June 2012 already forced many brand vendors to now use the design, which can significantly reduce the size and weight of the system. 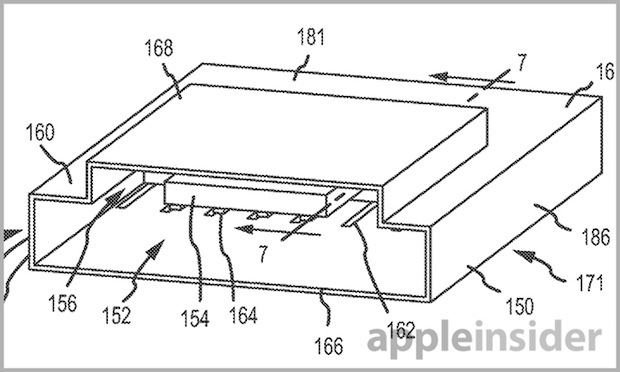 With the hybrid USB/SD port patent, the sources are concerned that it could give Apple more advantages in design. As the Taiwanese hit-or-miss news site’s sources point out, the combined SD card reader/USB port could save up to 13 mm of space. Taiwanese connector maker Kuan Yan said that a conventional SD cart port measures 27.1 mm in width, and a USB port 13.5 mm. By combining the two ports, Apple would be able to save between 12 and 13 millimetres of space on the notebook’s exterior design, and also enable the company to add more functions to the portable computer.